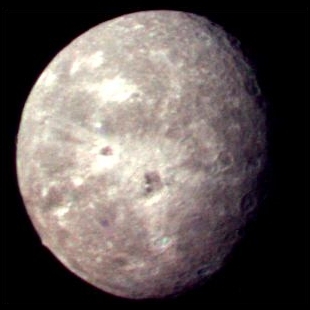 The moon Oberon is the outermost of the five major satellites of Uranus and, with a diameter of 946 miles, is the second largest. Its dimensions also make it the ninth largest in the whole solar system. It lies 362,582 miles out from the planet, which it orbits in 13.5 days. The surface of the moon Oberon is very non-reflective, making it the second darkest moon, after Umbriel. It is comprised of water ice under which is an interior of rocky material. Because of its high density, it is thought that this rocky core is around 300 miles thick, making it just under two-thirds of the moon's total radius. There may also be a subsurface ocean separating the crust and the core, but this depends on the presence of ammonia, which acts as a sort of "anti-freeze". Not enough is known about Oberon's interior to say for certain. Oberon displays two types of surface features: craters and canyons. For some reason, it is the most heavily cratered of the five major moons. The largest known of these is Hamlet, with a diameter of 128 miles. An unnamed mountain has been observed near the south-east border of the moon's photographed area. It is nearly seven miles high, making it the ninth tallest mountain in the solar system. It may be the central peak of a huge impact basin of 235 miles, but because only 40% of the moon's surface was imaged by the Voyager probe, this remains conjecture. The canyons that criss-cross Oberon's surface, though similar to those found on Titania, are nowhere near as numerous. They are like the rift valleys found on Earth and were probably formed by the ice crust splitting, creating giant cracks. The largest of these is Mommur Chasma, which is 334 miles long. Some of these "chasmata" actually cut through craters, indicating that they were formed later.